The average person reads about 200 words a minute with a 60% comprehension rate. That effectively means they're only reading 120 words every minute. At this rate it would take an average SIX SOLID HOURS to read a small 200 page book. In this fast paced world "Time is Money". Speed reading skills, increased comprehension, and the ability to recall what you've read can be invaluable! If you're visiting this site you probably already realize this - Speed Reading is POWERFUL. And you've probably wondered how the many speed readers in the news or documentaries read an average book in just an hour yet retain and recall virtually the entire book. They use basic speed reading techniques but they also have some extraordinary secrets up their sleeve! Mine name is Michael Masterman and for the past 10 years, my accelerated learning team and I have studied many speed reading courses, training seminars, and so-called 'speed reading software' from the "experts". We discovered many hidden techniques that aren't published or conveyed anywhere. We've commissioned masters to let us in on their secrets, then combined all this amazing knowledge into one powerful course - The Speed Reading Secret! Improve Reading Speed & Comprehension Book! - This 80+ page bonus guide, co-written by us and Bradley Thompson, shares many of the secrets from our audio course! How To Get MORE Accomplished in LESS Time! - Need to blast through your workload? Read this bonus and discover the 113 tips and tricks to help you boost productivity and overcome procrastination. TWO Speed Reading Hypnosis Downloads! - I'll send you a voucher to redeem for two FREE hypnosis downloads, on accelerated learning and speed reading. Advanced Memory Course! - Want to commit what you read to your long-term memory? This excellent 60+ page course from Andy Gray shows you what you need to know. Highly recommended! Bob Bastian's Self-Improvement Tips! - Discover the ultimate resource for improving your mind and body. Read through over 100 pages of solid information and development resources! Maverick's Guide to Damned Good Fiction! - Why not read more fiction with your new skills? Tracy Cooper-Prosy presents a reader's roadmap for the 21st century - covering amazing books you've probably never heard of! All materials will be delivered immediately for download. Your currency will be automatically converted to $29.95 USD. 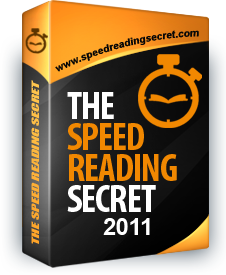 REMEMBER...Try this advanced speed reading audio course (and all the free items) for 30 days and if you are not AMAZED by your personal results, just drop us an email or contact our 24 hour support line for a 100% money-back refund - NO Questions Asked. The $100 value free gifts are yours to keep as a thank you. Easy To Use AUDIO Course! "When I bought The Speed Reading Secret, I thought it was too good to be true. However, I always like to try and see. My usual very slow reading speed was 240wpm. After, going through your course only twice, my speed is now 540wpm!! Wow, It really does work. Thank you for giving me a skill that will be of huge benefit to me to learn, study and gain knowledge. I can't wait to see what my speed will be one month from now!! I am now reading books quite fast. I have developed a voracious appetite for knowledge gathering and reading. Well done on a wonderful product." "Michael is practically the Father of Accelerated Learning. I just sat his course and literally quadrupled my reading speed in an hour - and I'm already a FAST reader. Absolutely amazing!!" "Thank You, Michael - this course absolutely opened my eyes! I've at least tripled my reading speed and in just 60 minutes. I went from 300wpm to over 1000wpm. This will REALLY help my editing!" "Please publish this on your testimonials page. Dr Michael Masterman is a genius! I've attended one of his seminars and The Speed Reading Secret beats it all. I can now read almost any book in FORTY minutes.All thanks to Michael!" "To be honest, when I bought this course I didn't realizse what an effect it would have on me. It's brilliant, pass on my thanks to your team and Michael. Excellent, excellent, EXCELLENT. I'm still in SHOCK at how good this stuff is!" Copyright © 2012 Self Development Network. All rights reserved.